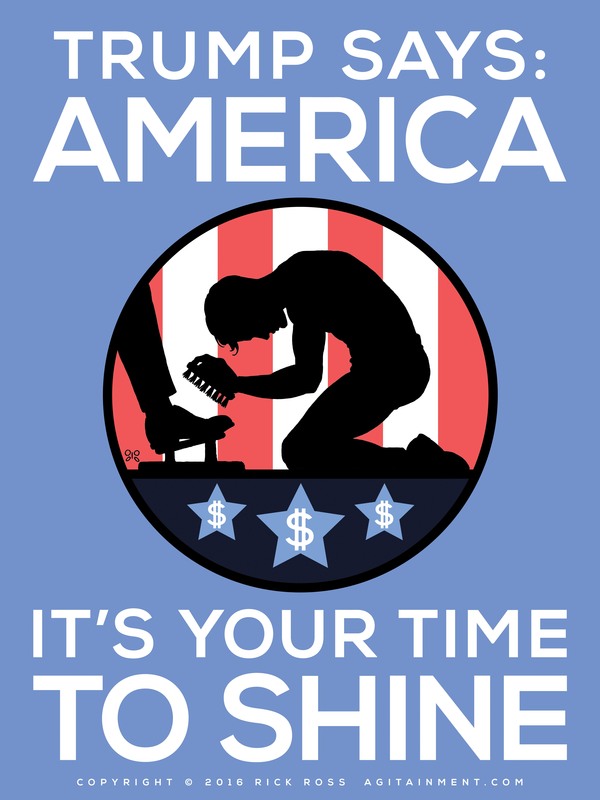 America: It’s Your Time To Shine is the new poster from Rick Ross. And just in time for the 2016 Presidential debates! Download your free copy below and share it online or print it out and share it in person. Why have I made this poster, you may ask? Well, over the last year, I’ve spoken to many friends and family members about the political climate of our country. Across the board, from conservative to progressive, the vast majority are astounded that someone like Donald Trump could ever have become the Republican nominee for president. Given his provocative and outlandish remarks, his waffling, his outright lies, most still can’t believe he remains a viable candidate. And as a result, a number of lifelong Republicans I know won’t even vote in this election and feel helpless about the state of their party. Many progressives I know see his dangerous demagoguery as a threat to our freedoms and feel helpless about the state of our country. It has been the responsibility of artists throughout the ages to search for truth–in nature, in humanity, in art itself–and to represent that truth back to their own age and culture. Sometimes the effort is met with acclaim, sometimes with hostility. But an artist, to be true to their calling, must speak. We are all vulnerable if Donald Trump rises to the office of President! If you agree that a Trump presidency would be disastrous and no longer feel you can remain silent, then I urge you to share this poster online. If you want to print it out, here are links to posters in 9″x12″ and 18″x24″ (right-click the image that comes up to save to your computer). Put it on your fridge. Put it in your windows. Put it up in your yard. But for heaven’s sake, do not remain silent. Because one way or another, it’s your time to shine!